Home / News / Work Day 2016 Approaches! See below for information on scheduling, attending, registering, and spending the night at Work Day. If you have not already done so, please sign-up now. Final work projects have been emailed to all group leaders and work guides. If you have not received your project, contact us immediately. Make certain you know where your project is located and you know what your project entails. If you need additional people to complete your project, we can assign you additional workers on the morning of March 5. Please let us know as early as possible. Please make sure you bring the tools necessary to complete your project. It is not too late to become a work guide or bring a work group. We can always use the help. If you would like to know your project before March 5, please contact us. If not, you will be assigned to a work group on the morning of March 5. Please make sure to arrive no later than 8:00AM, since work groups leave for work at 8:30AM. What should you wear? Appropriate clothing that can get dirty and layered clothing depending on the weather. Do not forget work gloves. What tools are needed? Chainsaws are always needed. If you have a chainsaw, please bring it. If you have any heavy machinery you wish to bring, please let us know ASAP. Men and boys may sleep in one of several places: they may stay in the old monastery cells and chapter room, camp on the property or reserve a room at the abbey. Please remember that the old cells are not reserved. They are available on a first come-first serve basis. It is a good idea to bring a mat and sleeping bag, just in case. We can always put people on the floor. Women without prior arrangements should contact us ASAP about lodging. Breakfast and lunch are provided on March 5. If you come early or stay late, you are responsible for your own food. All girls wanting to work at the Convent should report to the same location as the other workers. At 8:30, the Sisters are expecting you to walk over. We need several adults to accompany the girls and help organize their work with the Sisters. Email us if you would like to do this. Sign up for the work day by registering on the website at www.abbeyworkday.com. All parties planning on attending work day should RSVP, even if you have already talked to us. This allows an accurate count for food purchases. Invite your friends! If they are not familiar with the Abbey Work Day, send them our video. Click here for the video. If anyone is coming from the Little Rock, Arkansas area please contact us if you would be willing to pick up trees for the Abbey. 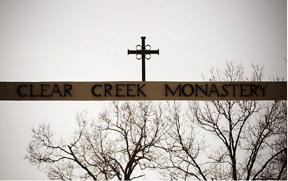 Donations: The monks are always in need of farm supplies. Tools, feed, fencing materials, and money are welcome. We will gladly accept monetary donations large and small. Contact us for details. If you cannot donate, do not worry. Everyone is invited to Work Day! We will not ask for money on Work Day. Your time and labor is what we want.